At the end of last year when I received this very thin volume entitled The Diet Dropout’s Guide to Natural Weight Loss. I rolled my eyes and tossed it aside. I mean really! Who isn’t a diet dropout?! And why the cutsie title? Over the weekend I finally started catching up on my reading. I picked this up since the title was cute and the book was small, I figured it would be a quick skim and then to the discard pile. Most diet books are pages and pages long and chalk full of useless information. I think a lot of these writers have the mistaken idea that they will be paid by the word. Or they are trying to prove how smart they are. In either case, I am usually bored by page 20. This book, however did NOT bore me. In fact, I found everything written was relevant and even interesting. There is nothing new or startling; but it is not a boring recitation of facts either. He takes the standard information and presents it clearly and concisely. The format might even seem simplistic at first, but the 10 short chapters cover everything you need to know about taking and keeping weight off. He talks at length about temptations: highly palatable foods that don’t satisfy, large portions, cheap convenient junk and fast foods, tempting sugary drinks and passive entertainment like TV. He makes the point that these temptations are really a collection of bad habits and that if we want to keep weight off, we need to change our habits by eating real food, not getting too hungry, avoiding junk and fast foods and getting more exercise. He talks about stress and the emotional eating aka self medicating. And he give some very simple advice for dealing with emotional eating: focusing on the present, thinking positively, relaxing, socializing, and doing something productive. He talks about dealing with cravings. Cravings are a very natural phenomena, not something to feel guilt about or to use as an excuse for bingeing. He has a simple 9 point method for curbing those cravings. He even provides lists and cards to help you out. Other chapters talk about the math of weight loss, eating less, changing food choices to a more plant-based diet, getting sleep and creating a healthy environment, boosting your metabolism (exercise) and the myths about weight loss. The winner, however is the last chapter: Easiest Path: 56 ways to weigh less . He asks you to read the 56 ways and to pick the two that are easiest to do; figure out how to make them personal and use that as the starting point for changing your eating habits. Not 56 all at once. . .only 2! Finally, the appendix contains some simple recipes. Best of all – the eBook version is $3.00 and you can get a used copy for about $4.00. Trust me, it is worth a lot more! 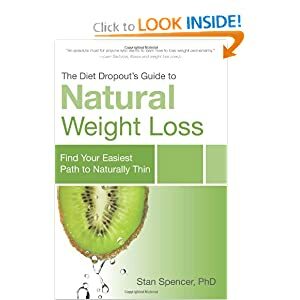 This entry was posted in book review, Stan Spencer, weigh loss, Whole Food Plant-Based Diet Experts, Whole Food Plant-Based nutrition and tagged Diet, Health, Nutrition, Obesity, Stan Spencer, The Diet Dropout's Guide to Natural Weight Loss, weight loss. Bookmark the permalink.